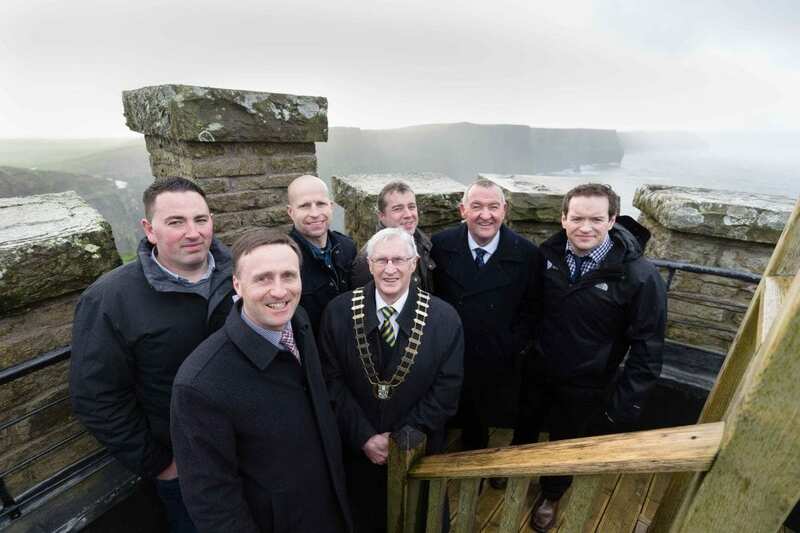 Pictured at the contract signing for O’Brien’s Tower at the Cliffs of Moher Visitor Experience were (L-R) Pat Dowling, Chief Executive, Clare County Council; Councillor Michael Begley, Mayor of Clare; Donnacha Lynch, Acting Director of the Cliffs of Moher Visitor Experience; Leonard Cleary, Director of Rural Development, Clare County Council; and Kevin O’Leary, Mid West Lime Ltd., Kevin Hennigan, Cliffs of Moher Visitor Experience; and Austin Dennany, Dennany Reidy Asc. Photograph Eamon Ward. Millions of people from around the globe have visited this famous Irish tourist spot since local landlord Cornelius O’Brien constructed it in 1835. The viewing platform is located near the highest point of the 214-meter high cliffs and provides views of Clare, the Kerry Mountains, Galway Bay and the Aran Islands.